Celebrate Lent, Holy Week and more with a variety of refreshingly joyful music from Janèt Sullivan Whitaker. 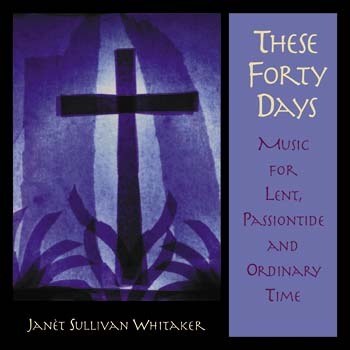 This 14-song MP3 album by Janèt Sullivan Whitaker features five psalm settings with verbatim Lectionary texts, a Lenten Gospel acclamation and two songs with children's choir accompaniment. Many titles are suited for celebrations throughout Ordinary Time, weddings, funerals and more. The collection includes five psalm settings with verbatim Lectionary texts, a Lenten Gospel acclamation and two songs with children's choir accompaniment. Many titles are perfectly suited for celebrations throughout Ordinary Time, weddings, funerals and more. As we prepare for Easter our hearts should sing for joy, knowing that Lenten prayers and practices only speed us along. With These Forty Days, Janèt Sullivan Whitaker gives the Church a refreshingly joyful, major-key approach to this holy season. The 14 songs include five psalm settings with verbatim Lectionary texts, a Lenten Gospel acclamation and two songs with children's choir accompaniment. Though intended primarily for Lent and Holy Week, many titles are perfectly suited for celebrations throughout Ordinary Time, including weddings, funerals and more. Known for her ability to compose in a wide range of styles, Janèt has put together yet another wonderfully eclectic mix of music. She recorded five new arrangements of traditional-style hymns in a church with a pipe organ and fabulous acoustics. Two songs feature an authentic R&B band accompanied by a gospel choir. Her setting of "Calvary," the traditional spiritual, has parts for guitar, mandolin and blues harmonica. Other excellent additions include a traditional Eastern Orthodox hymn, a song for the veneration of the cross on Good Friday, a meditative Lenten Communion processional in the form of a Taizé-style chant and a song for communal reconciliation services as well as the RCIA scrutinies—all adaptable for use in both intimate chapels and grand cathedrals. Blessed with a rich, powerful voice, Janèt Sullivan Whitaker is one of the more innovative liturgical composers in the Church today. Her third collection celebrates Lent and Passiontide with a joy that is proper to this time of preparation and conversion.